Circuit Assen is the longest running location on the MotoGP calendar and is known in motorsports circles as “The Cathedral.” If you are going to name a jacket after Assen, it better be serious. 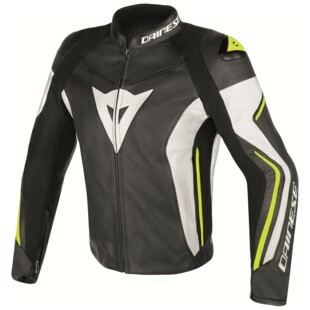 The Dainese Assen Leather Jacket is indeed serious. This jacket is designed for the avid sport rider and features like Grid cowhide leather, composite protectors and aluminum shoulder slides prove what the new Assen is all about. It features an aggressive cut and arm pre-curve built for the three-quarter and tucked positions. The S1 bielastic fabric allows just jacket to fit with a variety of body types and also works with you when you are hanging off the bike in the twisties. Overall, the Assen Leather Jacket offers a sharp package with a lot of great protective features for sport riders. It is a special jacket named after a special track, just ask Jack Miller!